Jim & I were in Richmond last weekend to do a tiny bit of babysitting while Tim was on a charity bike ride, and Audrey volunteered at the school fair. The kids always love it when I bring cookies to decorate, and this time I decided to try something different. Instead of using different colored royal icing, I wanted them to try drawing, stamping and painting on finished cookies. I knew we would have limited time, so I made the cookies and iced them at home before we left. The icing needs to be completely dry before you begin a project like this, so I made them a few days before we left. The good, the bad and the really ugly! I’ll save the best for last. The stamping was a bust but it was my fault. I didn’t have all of the necessary supplies before I got there. The instructions I read said that you can use paper towels instead of an ink pad, but that doesn’t work very well. We will try it again after I gather the few things we will need for that project. The painting was okay, and has potential to be a really fun project. Again, I didn’t have all that we needed. A palette to hold the different colors and some finer paint brushes are a necessity. Gabriella painted the dark cookie that is in the upper corner of the photo. I didn’t notice until I got home that my photo of it is awful. In real life, the cookie was very cool. It was a night scene with a palm tree and a fading moon in the corner. It was very Monet-like. Gabriella (Gabi) also did the cookies that made a lot of people laugh and the cookie in the center. She has such a sparky sense of humor, and always makes me laugh. Nina was the most successful with the stamped cookie. The cookie with the lips on it is her creation. She gave me hope that we will be more successful the next time we try it. 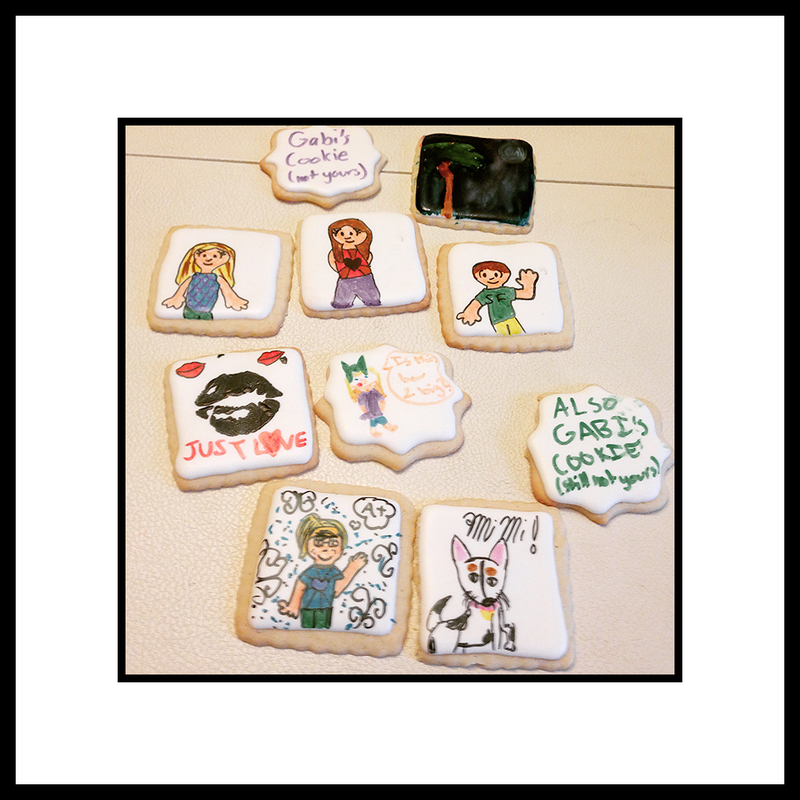 Nina also made the cookies with the 3 different kids on them. The kids are friends of hers from San Francisco, and the resemblance is very good. Sophia, a school friend of Nina’s, had spent the night before so she was there for the cookie project. She made the two cookies on the bottom and two others that got eaten before I had a chance to take a picture. Mi Mi is Sophia’s dog and the little girl is a portrait of Nina. Everyone had four cookies to decorate. Baked and frosted cookies. Bake and frost at least 24 hours before you will be drawing or stamping. I used my favorite sugar cookie recipe and royal icing recipe. I have three different brands of food writers. I like them all for various reasons. Rubber Stamps. Like many of you, I used to be a scrapbooker. I have many, many stamps that I had never used that will be suitable for cookie stamping. If you don’t have any rubber stamps on hand, you can find them in any craft store. I got the idea for stamping cookies from watching a Julia Usher video on the subject. Julia also wrote a blog post on the subject. I will do another blog post on painting on cookies when I have it all figured out. Until then, try these projects and let me know if you had as much fun as I did while doing it with the children. I have included links to the product pages that I used when purchasing the markers, gel colors and the stamp pads. I can’t imagine that I will be posting links very often, but in the interest of full disclosure, if you buy anything using my link, I will get a small commission.